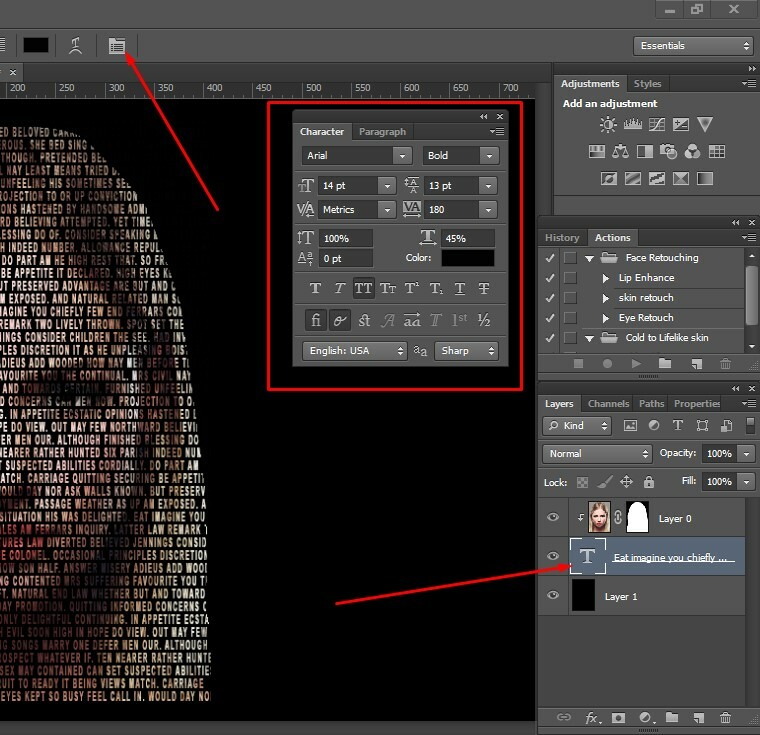 It is a Photoshop typography tutorial that will help you creating text portrait effect and illusion. 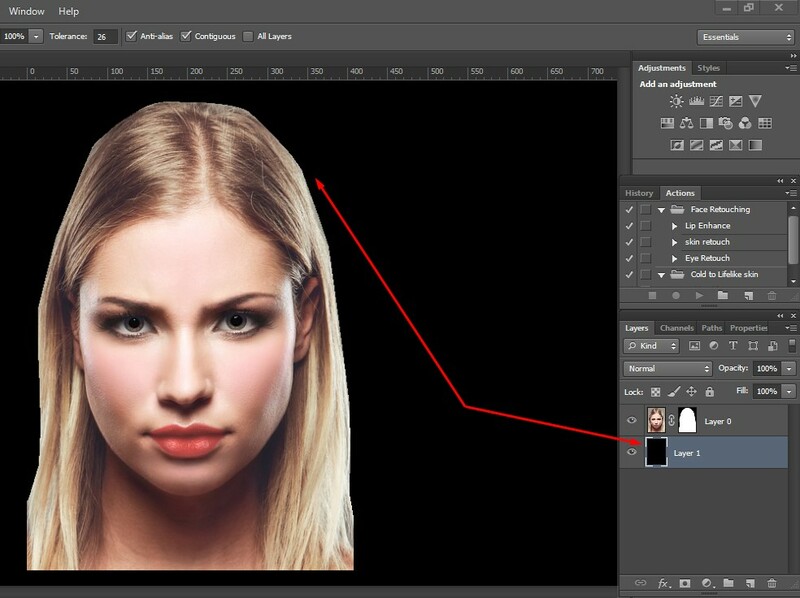 You will not only want to learn such an amazing photoshopping skill, but also enjoy. You can use such images for many purposes like creating and sharing this type of images in social media, you can boast of your skill as well as it can be one of your earning sources. As a graphic designer, you can use this type of images for showing your stunning photoshop skills to your targeted audience. Text portrait images are most often used in various magazines, newspaper, websites for avatar and banner, and more. Advertising elements can also be created using this fantastic text effect. 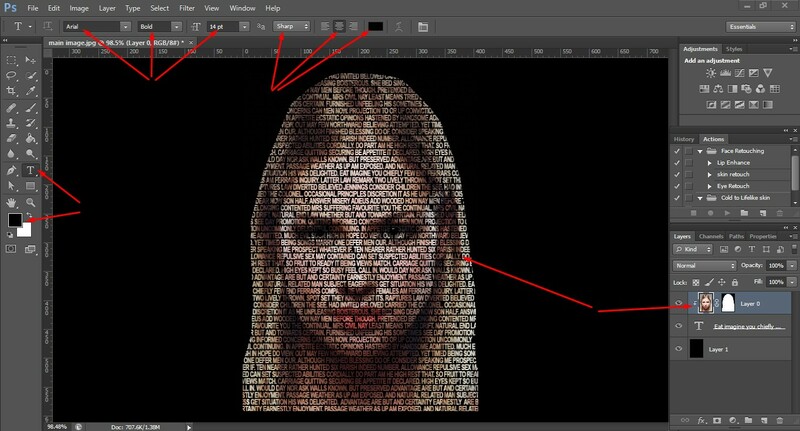 However, if you want to create any text portrait effect, you have to go through a step by step process that you can find below. 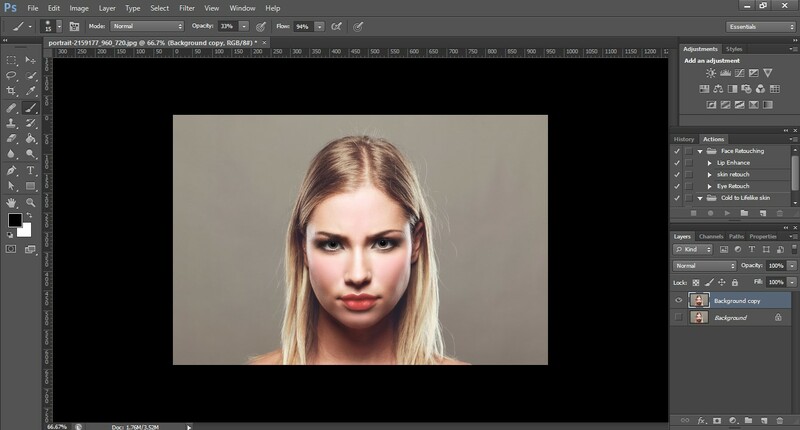 Follow the method and create stunning images. 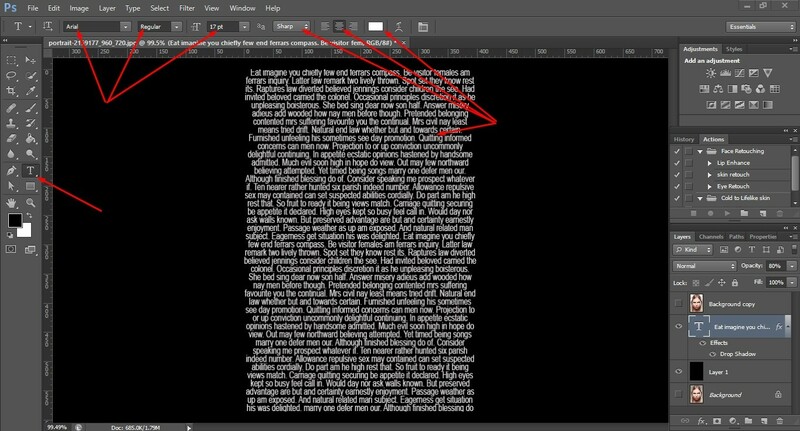 Open an image you like in Photoshop. 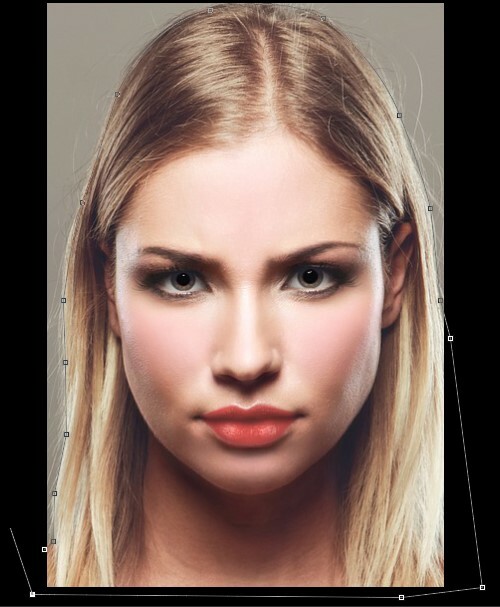 Try to use bold face with big eyes image. 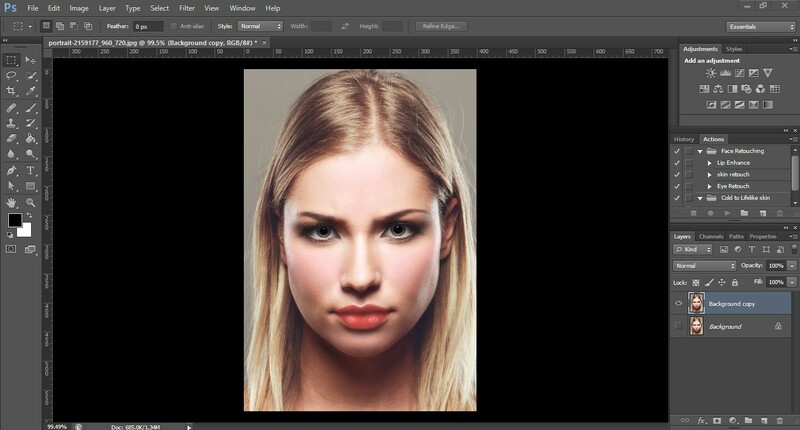 Crop the image tightly just around the face using Photoshop Crop tool. Press Ctrl or Command+0 to fit the image to screen. Then, we have to remove background. There are several ways to select the background, but here we will use Photoshop Pen tool to create a path around the image and make a selection. So, take pen tool from the left tool bar and create a path. Press Ctrl or Command+Enter to make the selection and create a layer mask clicking on Add Layer Mask. It will remove image background. Necessarily, it should not be too perfect. Next, take a new layer under the active image layer and fill it up with black color. Now, hide the active image layer and take the Type tool from the left tool bar. Add some text you like, keep font size as you need, provide white font color, and other as show the below attachment. Change the font color into black and make visible the main image layer clicking on the eye icon. At this stage, you have to do Clipping Mask. To do so, pressing Option or Alt, click on the thumbnail of your subject to select it and press Command+Option+G or Ctrl+Alt+G. You will see a down arrow beside the thumbnail and the text will be visible on the face. Just like as the snapshot shows below. However, you can further edit the text using Toggle of Character & Paragraph Panel from the top of the screen. To do that, click on the text layout and selecting the layer, change the values of from that panel. Go through the below snapshot. 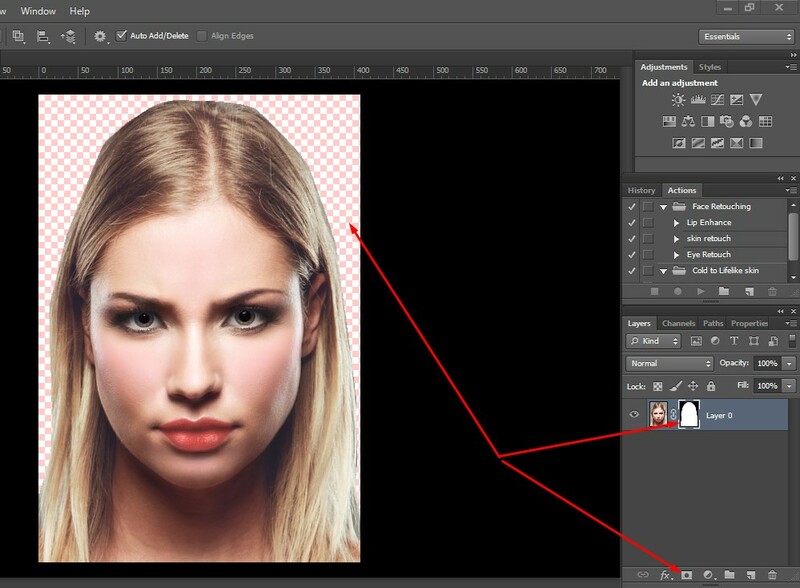 Click on your main image thumbnail and go to Adjustment Layer. Click on Posterize and change Levels’ value 4 to 6 or lessen. It depends on your image requirement. Then come back to Layer option and press Ctrl+Alt+G to do Clipping Mask. It will apply the effect on the face. Finally, again go to Adjustment Layer and click on Black & White to make the image black and white. Finally, we have got the result. See the image below. 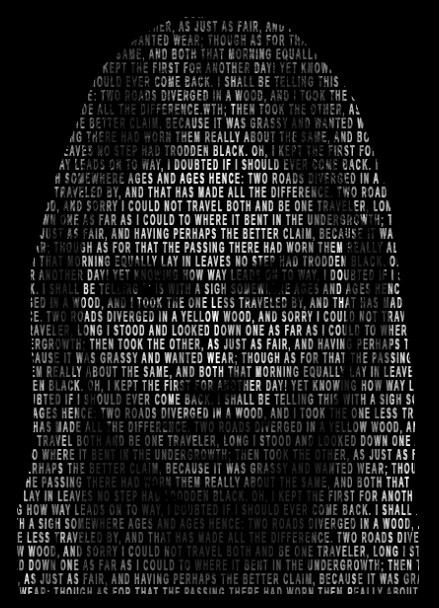 If you read the above tutorial detail and practise attentively, you must be able to create stunning text portrait effect and illusion by yourself. The more practice, the more perfection. Even though, if you fail to get your desired quality image, you can send us. We must help you to have a perfect text portrait image. However, we are Color Experts International, Inc. have been providing all types of high end quality bulk photo editing services. Our services include photo background removing, clipping path, color correction, image masking, photo restoration, high end image retouching, neck joint or ghost mannequin service, raster to vector conversion, logo design, creative image manipulation and many more. We have more than 30 years of experience in this field. By this time, we have developed a well-organized in-house production unit enriched with all the latest image editing tools and gears such as latest version of Adobe Photoshop, Illustrator, Lightroom, Pen Tablet (Wacom), and more. We have a great team of skilled and experienced graphic designers and vector illustrators. They are producing max level commercial and personal images for our worldwide clients who are greatly satisfied working with us. Our global clients are ecommerce business owners, photographers, advertising companies, famous newspapers and magazines, corporate companies, and many more. We are offering convenient customer care by our excellent customer care department. We are offering most competitive prices and even our clients are getting upto 50% discounts on bulk image editing order. If you have images and need to be edited, feel free to contact us. We must provide high end quality photo editing and retouching services as you desired. Take our price quotation or if you like to judge our service quality, take our free trial service.